What started as a hacking attack on Google began to have significant repercussions across the world last week, as French, German and Australian authorities recommended PC users avoid Internet Explorer until a critical security flaw was fixed. Although a patch has now been issued, these security alerts are less clear about exactly what you should use instead, though, which might leave you with a question: which is the most secure browser? The answer, unfortunately, is none of them. Every browser has its share of security problems, and the worst offenders aren't always who you might think. 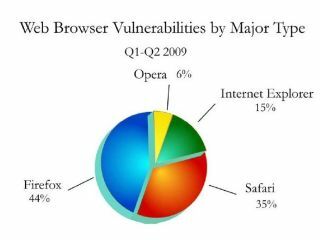 A Cenzic report on browser vulnerabilities last year, for instance, found Firefox responsible for 44 per cent, Safari 35 per cent, while IE trailed with only 15 per cent. No browser can guarantee your security, then, but there are steps you can take to significantly cut your online risks. Here's what you need to know. The older your browser, the more security holes it's likely to have. If you're not using IE8 (or the latest version of your browser of choice), then upgrade right now for a little extra protection. Your browsing safety will be compromised if you're still using Windows XP, though, as it won't support all the new security technologies Microsoft have introduced in recent years. If you're thinking about moving to Windows 7, then now would be a great time to do it: you'll be much safer online. Take the time to explore your browser's Preferences dialog, and make sure that it's using the tightest acceptable security settings. In IE, for example, click Tools > Internet Options > Security, and check the "Enable Protected Mode" option if you see it. Adjust the slider to set the Internet zone security level to high, too. This can be very restrictive, but if you find it blocks a favourite site from working, then return to this dialog box, click Trusted Sites > Sites > Add, and it should return to normal. It's essential to have a regularly-updated antivirus tool. The new Avast Free Antivirus, say, monitors downloads, email attachments, instant messaging traffic, network connections and more to keep your PC safe. An extra layer of protection can help, too. ThreatFire monitors your PC for malicious behaviour. It can run alongside most antivirus tools, and may detect malware that they miss. Browser plugins and extensions can make a real difference to your security. For example, McAfee SiteAdvisor rates sites for spyware, spam and scams, displaying warning icons in your search engine links so it's easy to avoid most dangers. And Firefox can be made significantly safer by having the free NoScript block scripts and other active content, and using Adblock Plus to block annoying ads.